Routes on Elbrus, the summit of Europe. The seven summits, the highest peaks of the 7 continents! Trips, Statistics & information! There is one main route to the summit, coming from the South. A more interesting possibility is to climb from the North, also non-technically, but with fewer climbers, no cable cars etc. Join the new 7summits.com Elbrus traverse, from North to South! See the trips pages for more information. The routes starts at the cable car in Azau. If the cable car is not running or you want to do it "pure" than you can follow a dusty track around it. The tracks meets up with the cable car at the halfway station where you have to switch cable cars. Continue by cable car to Mir station (3500m) or follow the path, which crosses some snow fields which can be quite steep below Mir. The track roughly follows the lift and makes for a nice hike. Continue along the wide but safe Garabashi glacier until you reach the new Diesel hut (the old Priutt 11 hut burnt down in August 1998, you will see the remains of the Pruitt 11). The remains are found on a ridge leading up; the best camping spots are on the ridge, parallel to it, about 300m to the right; there are also a few tiny shelters, but don't count on space. If you look up to the east summit (which is closest) you will see some rocks halfway, these are the Pastukhov rocks, 4800m. Is it a good idea to make an acclimatization walk to these rocks the one or two days before the summit attempt. Continue the track along the marker poles (useful during the whiteouts!) toward Pastukhov rocks. Below the rocks the route will get steeper and crampons are advised, certainly in the summit night when all the snow is frozen solid. From Pastukhov rocks the route bends slightly to the left until it traverses to the saddle between the two summits. You will pass the remains of an old hut on the saddle and will traverse the west summit to the north. After a few rocks, make a left turn and go up to the steep part leading up to the summit plateau. Go straight to the little hill in front of you, this is the highest of the three sub peaks of the west summit and is marked with an iron triangular shaped sign with a machine gun and a pickel. The old route above Terskol is possible but crevassed and not maintained. 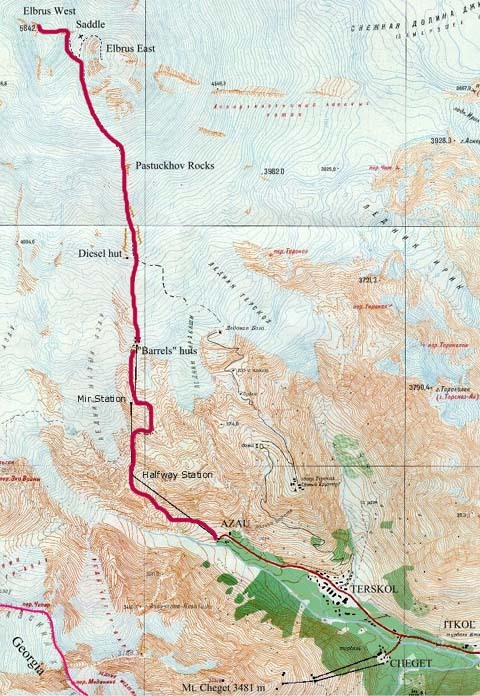 The Northern route is not marked here, but joins up at the saddle from the North. There are a few different detailed maps (1:50,000) available of the area; although they show different details of the same area! None of them can be completely trusted so a guide is advised, especially if you want to travel outside the crevasse-free normal route. The best place to buy the maps is in the little but fully stocked map shop in Moscow, near the Bolshoj theatre. Just ask the street vendors and they will point it out. EWP also has a map/guide book with a 1:80,000 map of the area as well as a separate 1:50,000 map.